Having automated, audible RADIUS warnings from the ALPHA lets me spend more time hunting, and less time worrying about my dogs and looking at that screen. For example, when I'm pheasant hunting with my flushing lab, Roxy, I want her to always stay within gun range which is about 25 to 30 yards away from me. Sometimes I can't see her because we're hunting in cover that's tall and thick. With the Astro, I have to look at the screen to tell when she gets out of range. With the ALPHA, I select a radius setting, and as soon as she gets 25 yards away from me it will warn me. Roxy is trained to come back to me when she hears a Tri-tronics TONE signal. All I have to do is wait for my ALPHA to tell me she is out of range, press the tone button, and she's going to come back into gun range. I don't even have to look down to press the tone button. 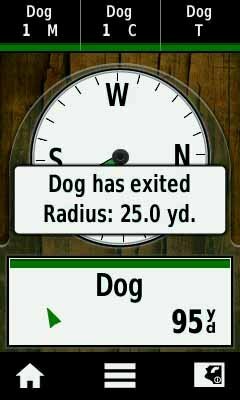 You can also set multiple radius alerts with the ALPHA which is very helpful with big running pointing dogs. Make sure the dogs are hunting big enough, but not out too far. Occasionally when I run two or three dogs on the ground, I can get distracted and have one get further out from me than I want, and not realize it until I have a problem. Having multiple RADIUS alerts solves that. For example, Stud, one of my English pointers, has a tendency to get away from me very quickly. In most places that I quail hunt, I like my pointers to run between 100 and 250 yards. If dogs are within 100 yards then either we're in birds, or they are not running quite big enough. However, if a dog gets out past 400 yards, he's stretched out a little bit more than I want, so I use 100 yards and 300 yards for my two RADIUS settings. With the multiple RADIUS settings, once Stud gets out past 300 yards, I get an audible alert. I check the ALPHA to see where he is, and which way he's moving. It's very easy to make a correction to get him going in the right direction if needed.